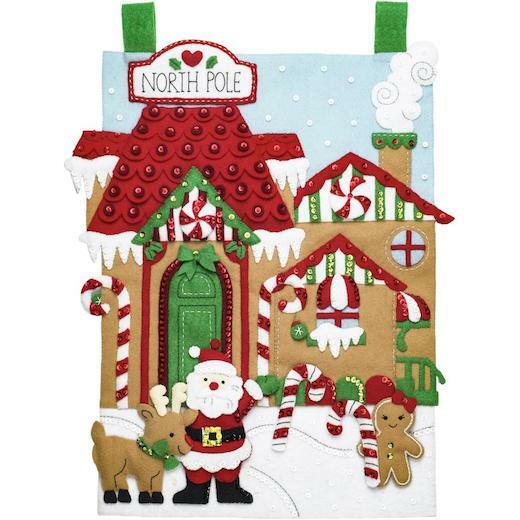 The North Pole Village felt wall hanging kit by Bucilla features Santa and frends bearing happy holiday candy canes in the frosty North Pole. Bucilla Felt Home Decor accents are a pleasure to stitch and to display, this kit is sure to bring the joy of the season to any room in your home. The kit includes everything you need to create one 15x15 inch felt wall hanging: stamped felt, white Pellon, cotton embroidery floss, colour-separated sequins and beads, two needles and instructions.